The time is finally here for K-pop’s greatest hope in the West to begin her attack. As K-pop fans, we have seen many before her attempt and fail to break the musical holy land, America. BoA, Se7en, Wonder Girls did not have what it takes. They, however, did not have the backing that 2NE1’s leader CL has at her disposal. Her overall style since her debut has generally taken a greater influence from the West, anyway. She seems to believe in and love her music which, whether true or not, is more common to a Western pop artist. Her performance style is more about putting on a good show than delivering crisp choreography. Moreover, she always has the famous friends like Jeremy Scott, Diplo, and M.I.A. Collaborations with them could raise her profile in the future. It comes as no surprise that Doctor Pepper is a sleazy hip-hop track so relevant to the US musical environment right now. Does this live up to the hype of K-pop fans though? And is it going to push her career in the US? Given that hearing Major Lazer on mainstream radio stations is very common these days, Doctor Pepper is the ideal jumping off point for CL. It’s a heavily synthesized piece of hip-hop that we have come to expect from everything Diplo works on. Musically, it doesn’t deviate from its stabbing electro riff for the most part. The clip clopping drum beat behind it keeps things interesting though. It’s a far cry from what most K-pop listeners will be used to. Yet, like Diplo said, K-pop is broad enough to be able to accept and promote just about anything, even super weird Atlanta hip-hop. This is really a showcase of the rapping talent featured with CL taking centre stage. It is here where the song really delivers. The repeating hook which CL lays at the beginning is a lot of fun. At first listen, it comes across as pretty cheesy, but there’s a wry cleverness to the lyrics that I like. It’s not a silly little rhyme about a soft drink, but an introduction of the baddest female.She’s letting the US public know how cool she is. Ice cool, if you needed help getting that. Her rap that follows is similarly simple in its lyric. It contains, however, some slight similarities to CL’s K-pop roots. The vocal inflections and auto-tune recall for a small moment more popular elements. Not to say this is exclusive to K-pop though, most rappers do switch from rapping to singing within one verse a lot. Here though, it seems much more natural due to CL’s incredible vocal range. It appeals to CL’s die hard fans and the party loving Western fans she wants. It’s a pretty good verse to officially open up herself to the public. But in order to leave room for supporting acts, it’s her only verse though. Those supporters are RiFF RAFF and OG Maco. Raff delivers a typically wacky and fun time while Maco has the Atlanta style flow that perfectly suits this music without overshadowing anyone else. The success or failure of Doctor Pepper will have a big impact on CL’s future American career. How the public reacts to it will probably affect what kind of music she continues with, i.e. sticking with Diplo’s signature sounds or going in a more popular root. The success of Nicki Minaj and Diplo’s own work on the charts with Major Lazer show that the style should not be a problem though. What will probably be the biggest issue is race, unfortunately. The public’s reaction to an Asian pop star getting involved in rap, especially Atlanta style since it’s so local, could be contentious, to say the least. Even though it’s very much in the popular realm now, rap fans have a strong loyalty to their music and artists, not unlike fans of K-pop. The roots of rap are also found in oppression and suffering, whereas CL is a well-travelled superstar who has seemingly never suffered a day in her life. It might seem unfair to assume that people will think this but it’s happening right now to Iggy Azaela, so we know it can happen again. Iggy is constantly being accused of cultural appropriation and it seems to have started hurting her career. I hope the difference between Iggy and CL is that CL actually makes good music. A lot can be forgiven for music that really speaks to people. While Doctor Pepper may not work as a complete song it does give out good vibes for the future. The style is at once popular and legitimate. The big name connections are there. CL herself is devoted to her music and wants to connect with new audiences. If this isn’t enough to push CL further than those who have tried to break America before, then I hope K-pop stops trying. No one else can do it. What do you think of CL’s Doctor Pepper? Share your thoughts in the comment section below and be sure to subscribe to the site and follow us on Facebook, Twitter, Instagram, and Tumblr to keep up with all of our posts. 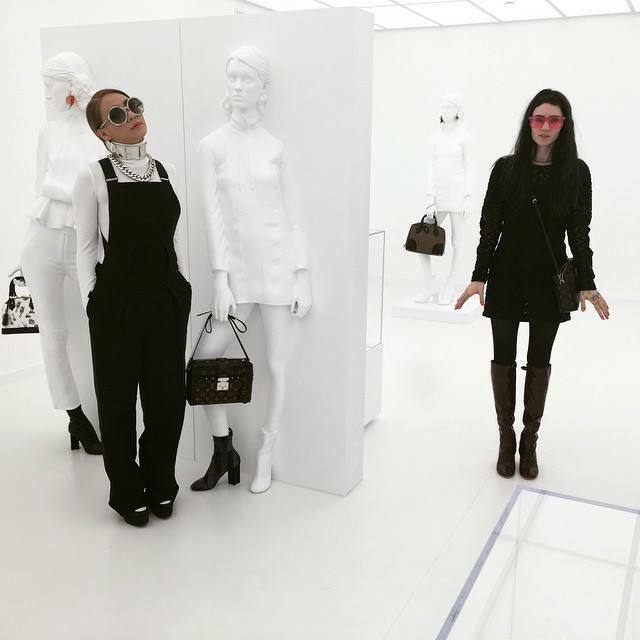 Is CL Collaborating With Grimes For Her American Debut Album? CL’s debut american album has been hyped a lot since it was announced last year. With an anticipated early 2015 release, we just can’t help wondering which direction she will take and who she will collaborate with. 2NE1’s leader has been praised by American media on her versatility with not only her talents, but her ability to transform herself with her looks. Grimes, an experimental Canadian singer-songwriter and producer is a known fan of K-pop, and a recent picture that she uploaded to her Instagram account makes us wonder if they are just friends hanging out together or if Grimes will have a hand in producing CL’s album. There are a very few names that have been already mentioned before that could possibly be collaborating with CL for her album. Diplo, a friend and frequent collaborator may have a big and important part on her album. His beats paired with CL’s fierce rap and vocals create a perfect match that was already seen in their live collaboration for the Style Icon Awards. Moreover, Black Eyed Peas frontman will.i.am. has previously collaborated with 2NE1, with an alleged full album, and has featured CL and Park Bom in one of his songs, and has now enlisted CL to join him and Black Eyed Peas on their new album. CL will feature on their 20th anniversary album to be released later this year. Without a doubt, CL is in the right track with the aforementioned collaborators, but what CL needs is a producer like Grimes. Grimes had already expressed admiration towards CL before. She posted on her Tumblr the music video for The Baddest Female with a caption, “CL is so cool.” Then when her American solo debut was announced, she couldn’t help but express her emotion via her Twitter. 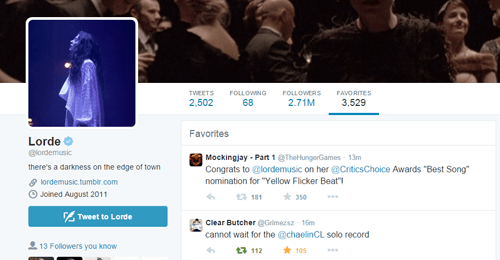 Even Lorde couldn’t resist and retweeted Claire’s (her real name) excitement. In order for CL to achieve success in the American market she needs to come out with a very new and fresh sound that will set her apart from the current Pop artists that reign American Top 40. Yes, she has to have that commercial appeal in order to gain attention, but Grimes can give her that innovative sound that will make stand out. Grimes’ music is so different; she experiments with different sounds and genres that are not that far from what’s being produced in K-pop. She’s definitely not afraid of trying new things. Take Grimes’ most recent track, Go, which was originally penned for Rihanna. This song is Claire’s attempt to go into the commercial route, but it still has that Grimes feel of her unique music. The song has dubstep, trap, synths, and other experimental sounds that she creates herself. If Claire takes this route with CL, she could seemingly showcase her beautiful vocals and rap on a song like this. If both ladies want to work on a more danceable track, but with a serious topic, then Grime’s Oblivion would be a perfect example of what they could come up with. Grimes’ tracks usually deal with sexism, misogyny, drug abuse, and alcoholism, and Oblivion deals with sexual assault. Her dark and obscure lyrics create a perfect juxtaposition with the music she does, but also bring awareness to these topics. CL has already stated that she wants to represent Asian women and break the typical Asian female stereotype. “I want to break that. I want to tell the world that there are some badass Asian female girls and that we can be cool. That we’re nothing different. I want to break that standard and stand up for all the girls,” she stated in an Elle Magazine interview. Grimes and CL could make the perfect girl power anthem that we have been longing for. Grimes producing CL debut American album would be ideal. Not only producing her music but also giving creative direction. Did we forgot to mention that they are both Jeremy Scott’s besties? Her visuals are always stunning and have a very different approach from what’s already out there. Claire’s music can’t be put in one genre given that her music is very unique, making it the perfect sound match for CL. Both artists are chameleonic in their artistry. What these women could achieve together would be amazing; their personalities and talents combined will be like a match made in heaven. Would you like to see CL and Grimes collaborate together?Let us know in the comment section below and be sure to subscribe to the site and follow us on Facebook, Twitter, Instagram, and Tumblr to keep up with all of our posts. https://i1.wp.com/kultscene.com/wp-content/uploads/2015/02/IsCLCollaboratingWithGrimesFeatured.png?fit=800%2C566 566 800 Alejandro Abarca http://kultscene.com/wp-content/uploads/2018/02/KULTSCENE-LOGO-2018-TRANSPARENT-RED.png Alejandro Abarca2015-02-06 21:32:312015-02-06 21:32:31Is CL Collaborating With Grimes For Her American Debut Album?